For the programmes for which Common Entrance Tests are not being conducted, the University will prepare a list of qualified candidates separately for each CET Code in order of merit based on the marks obtained by the candidates in the qualifying examinations and other conditions. The university will be conducting online counseling for thirty six programmes and also offline counseling for the rest of the programmes. On-line Counselling/Admission will be held for thirty six programmes such as B.Tech, Lateral Entry to B.Tech for diploma Holders, BBA, BCA, MBA, MCA, LLB, B.Ed BJMC, B.COM (H), BA Eng (H), BA Eco (H), LLM (Regular), MBBS, BDS, BAMS, BHMS, MBA(IT), MA(MC), MA(English), MA (Criminology), M.Sc. (Forensic Sc. ), M.Ed., MAHERIT, M.Sc. (NRM), MA(Eco. ), MCA (LE), B.Ed. (Special Education), BHMCT, M.Sc. (Yoga), M.Sc. (Nursing), B.Tech. (Biotech), B.Sc. (H)(Nursing), Para-Medical (BPT/BPO/BOT/B.Sc. (MLT)/BASLP), M.Sc. (EM) and M.Sc. (BC) on the basis of merit of rank obtained in the Common Entrance Test (CET) 2019. However, the candidates who will qualify CET-2019/National Level Tests as mentioned in Part A, must also fulfill the eligibility criteria of the qualifying examinations. 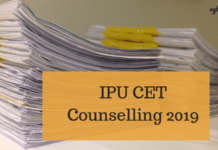 Here we mention the this year schedule of IPU Counselling 2019. The spot counseling shall be conducted offline, at designated centres by the University, between 01/08/2019 – 10/08/2019. This round shall be held after completion of the admission process, only for the purpose of filling up vacancies, if any. After completion of all rounds of online counselling „Spot Counselling‟ shall be done offline. All eligible candidates desirous of participating in the “Spot Counselling” shall have to pay a counselling (separate) participation fee. The participation fees in the “Spot Counselling” shall be INR 2000/= (non-refundable / transferable). The “Spot Counselling” shall be done for vacancies remaining after reporting of allocated candidates to Schools of Studies / Colleges / institutions alloted and arising during the process of “Spot Counselling” as enumerated below. Since, all conversions of categories / region-wise divisions are completed in the last round of online counselling, the spot counselling shall consider all seats to be filled as unreserved. The vacant seats left after reporting /admission of candidates to institutions only shall be considered for filling in the spot counselling. Any CET qualified candidates who have not taken admission in the rounds of Online counselling will be eligible to participate in the spot counselling, against the available vacant seat (if any). The candidates who are allotted seat in rounds of online counselling and have paid the part Academic Fee of Rs 40,000/- to confirm admission in any institute/ college and have also reported to the concerned University School of Study / college / institutions will be treated as “admitted” at the time of Spot Counselling. Such candidates, if they desire to participate in the “Spot Counselling” shall be required to pay a transfer fees of INR 5000/=, these candidates shall be considered as per their rank only, if they do not appear at the time of counselling for their rank, they shall not be allowed to participate. Moreover, the seats thus vacated by these candidates shall be offered to candidates participating in “Spot Counselling” with lower rank as compared to the candidates thus transferred. For such “transferred” candidates, the part academic fees paid by the candidate of INR 40000/= shall be adjusted during counselling. If a change of institution / college occurs of such candidates, then the institution / college from which the candidate is being transferred shall refund the balance fees paid (if any), that is the component of the fees paid by the candidate at the institution directly to the candidates on application by the candidate, and the candidate shall have to pay the balance fees (if any) of the institution to which the candidate is transferred as per schedule to be notified by the candidates. Any candidate, who was admitted in any round and subsequently withdrawn as per procedure, will be eligible to participate in the Spot Counselling. All admissions in the University shall be provisional till regularized by the University. All “not admitted” candidates will be eligible to participate in the Spot Counselling. Seats left vacant, if any, after spot counselling only shall be considered for admission process of filling up of vacancies after 31st July of the admission year. If any seats are left vacant (out of the seats reported as vacant, after the reporting of “admitted / allocated” candidates to concerned University School of Study / College / Institution and taken to the spot counselling phase for filling up) out of the seats considered in the spot counselling, the procedure for filling up these seats shall be notified by 4th of August, of the admission year by the University on its website www.ipu.ac.in. I’m facing the same issue. There is no notice regarding non-gate aspirants. Did you get any information? when will BAMS counselling conducted in ipu ? sir, i have got 724 rank in BHMCT exam do i have chance…. and when will the counselling schedule for BHMCT will be out? there is any college where i can get admission? if you know about very well…..
sir my CET No. is 163.I wanna ask what i the schedule for it First councelling.Please If possible pass me the detail regarding that at [email protected]. pleas tell the dates of counseelling for b,arch in I.P. its CET code is 100.even if the dates are tentative.i would be really greatful. sir , please tell me what is the complete procedure for spot conselling in ipu leet btech-128, university can give collage on spot , my rank is 201. at the time of spot 40000 is also pay? sir When will spot round start for bba and what is it’s procedure. his round shall be held after completion of the admission process, only for the purpose of filling up vacancies, if any. After completion of all rounds of online counselling ‘Spot Counselling’ shall be done offline.